The Sorcerer in the North John Flanagan Sci Fi. Book is in good condition, all pages intact. Though the war between the Skandians and the Araluans is years past, Will's challenges are not at their end. Now a full Ranger, he and Alyss must venture into the distant north to confront the sorcerous Night Warrior. 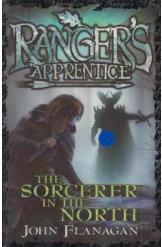 Book 5 of the Ranger's Apprentice series.